The parish was in the Tattershall sub-district of the Horncastle Registration District. 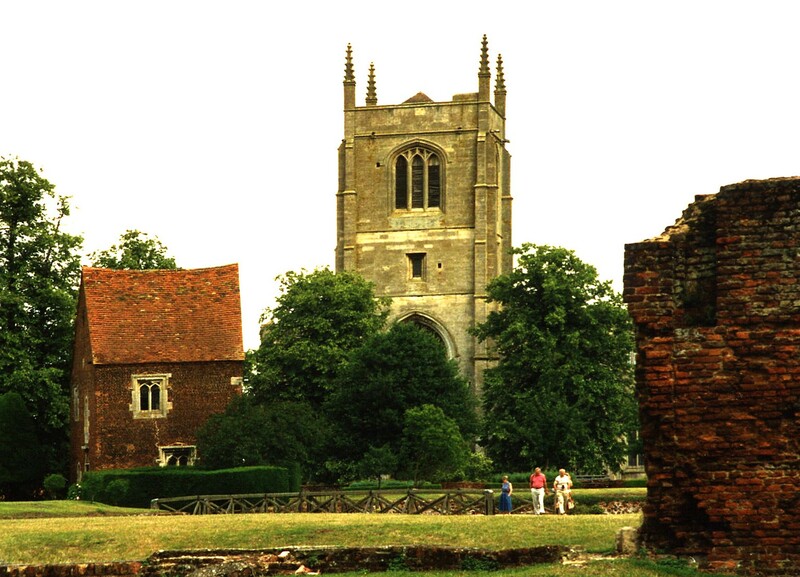 You can also perform a more selective search for churches in the Tattershall area or see them printed on a map. The church dates from just prior to 1455 (probably 1438-39). The church was unfinished at Cromwell's death in 1455. The church is built of Ancaster stone. The church stands about 80 yards east of the castle, near the outer fosse. This large church seats 520 people. An ancient brick building, near the end of the Market Place, is reputed to be the original parish church. The Anglican parish register dates from the year 1569. We have a small portion of a Parish Register Extract as a text file. Your additions or changes are welcome. The LFHS has published several indexes for the Horncastle Deanery to make your search easier. The Wesleyan Methodists had a chapel in Tattershall, built in 1849. The Wesleyan's also had a chapel in Tattershall Thorpe, a mud-and-stud building, which they rebuilt in 1865. For more on researching these chapel records, see our non-conformist religions page. Tattershall is both a village and parish about 120 miles north of London, 22 miles south-east of Lincoln and 9 miles south-west of Horncastle. Kirkby on Bain parish lies to the north. The River Witham flows along the south-west border of the parish. Coningsby parish lies across the River Bain to the south-east. By automobile, take the A153 north out of Sleaford and stay on it 'til you pass through Billinghay. The next village is Tattershall. Check the Tattershall Inns page on Rootsweb for places to stay or just visit. 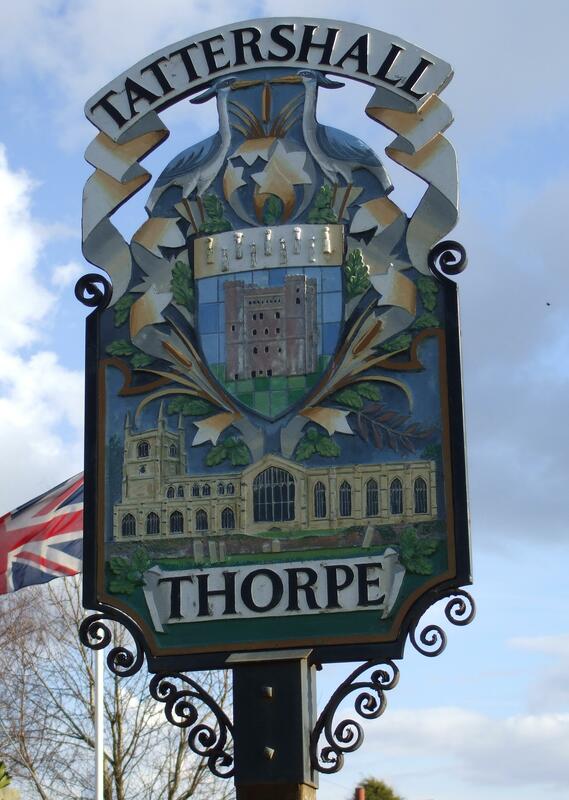 Julie Nicholls, in 2001, advised: "Tattershall is very rural, it is a village about 15 miles S.E. of Lincoln city and about 8 miles S. of Horncastle. It has a very impressive castle and at nearby Coningsby there is a Battle of Britain Memorial centre." Ask for a calculation of the distance from Tattershall to another place. You can see the administrative areas in which Tattershall has been placed at times in the past. Select one to see a link to a map of that particular area. Tattershall is generally considered to be the Roman site of Dorobrevis. They used it as a summer military station. Traces of the encampment can be found in Tatterrshall Park. Robert EUDO, in 1201, obtained a grant from Richard II to hold a weekly market here. Robert EUDO's son, Robert, obtained a license from Henry III to build a castle here. The first castle here was begun about 1230 by Robert of Tateshale, a descendant of EUDO. It is believed to have been finished in 1440. The current Tattershall Castle was built in 1434 by Ralph de CROMWELL, 3rd Baron Cromwell - Henry VI's Lord High Treasurer - on the site of the earlier 13th century stone castle, of which some remains can still be seen. The dramatic 15th century red brck tower, with six floors to explore, was restored by Lord Curzon betweeb 1911 and 1914. Find out more about the castle at the National Trust web site. 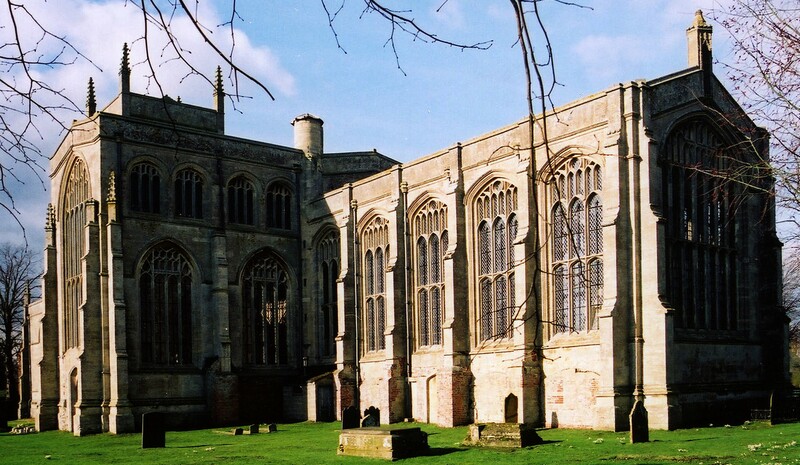 A college was founded here under Henry VI (1438-9) by Sir Ralph de CROMWELL. In the late 18th century, it was converted into a brewery before being left empty and allowed to deteriorate into the ruin that it now is. The walls that remain standing are shored up by modern brick. Heritage Lincolnshire is currently managing the site. A remarkably well kept 15th century buttercross stands in the Market Place. Markets are no longer held but the buttercross is still surrounded by shops. 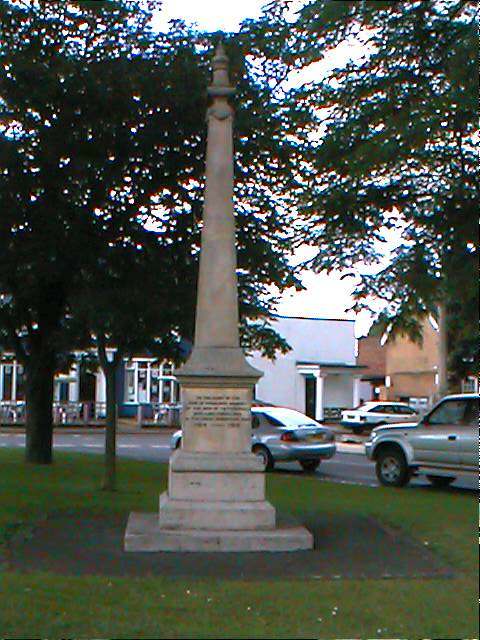 Richard CROFT has a photograph of the Market Cross on Geo-graph, taken in February, 2008. An annual cattle fair was held here each September 25th. The former railway line has been converted into a cycle path at a cost of £2 million. The path was officially opened in October 2008. Right after the Norman Conquest, King William gave the manor at Tattershall, along with Tattershall Thorpe, to Eudo and Pinco, two Norman nobles. 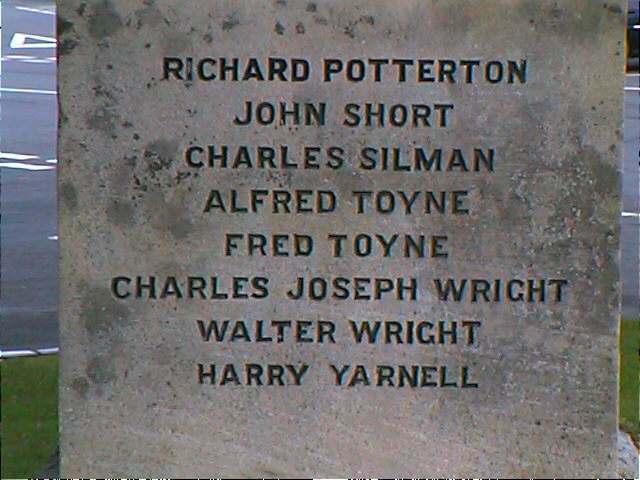 Richard CROFT has a photograph of the War Memorial on Geo-graph, taken in February, 2008. 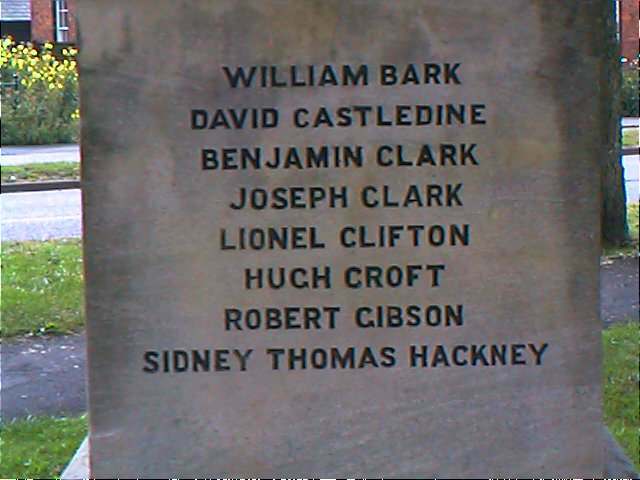 John EMERSON also provides this list of the names on the War Memorial from World War I. In December, 1880, a detached portion of Tattershall parish was ceded to the new Wildmore parish. 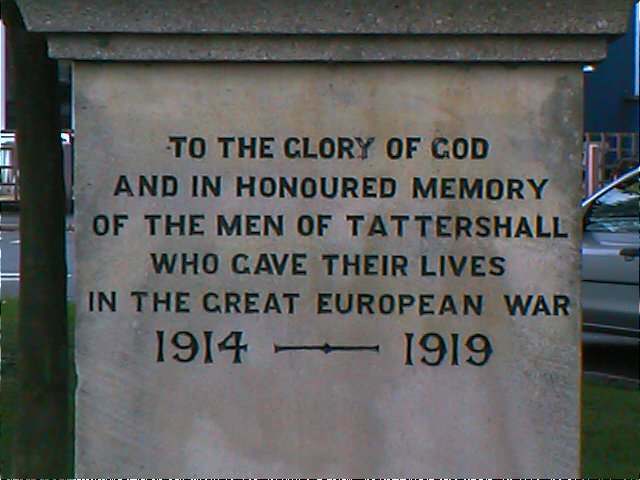 Tattershall was also a township occupying about 2/3rds of the parish. 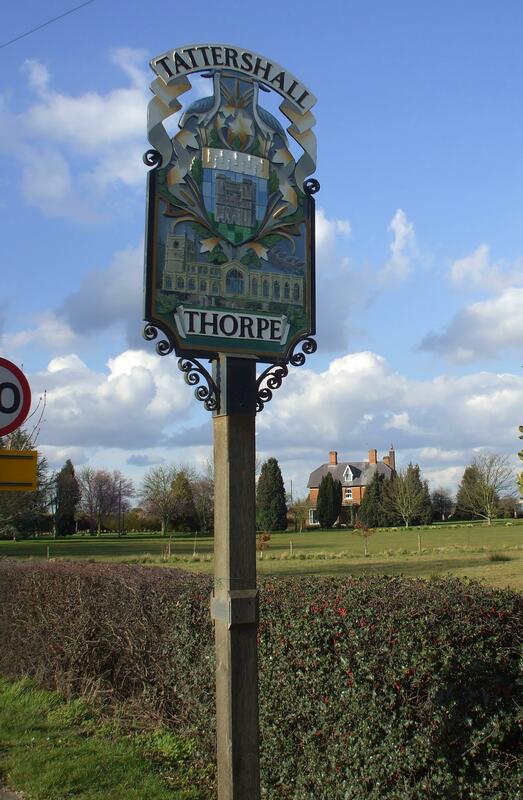 Tattershall Thorpe is also a township in the parish. 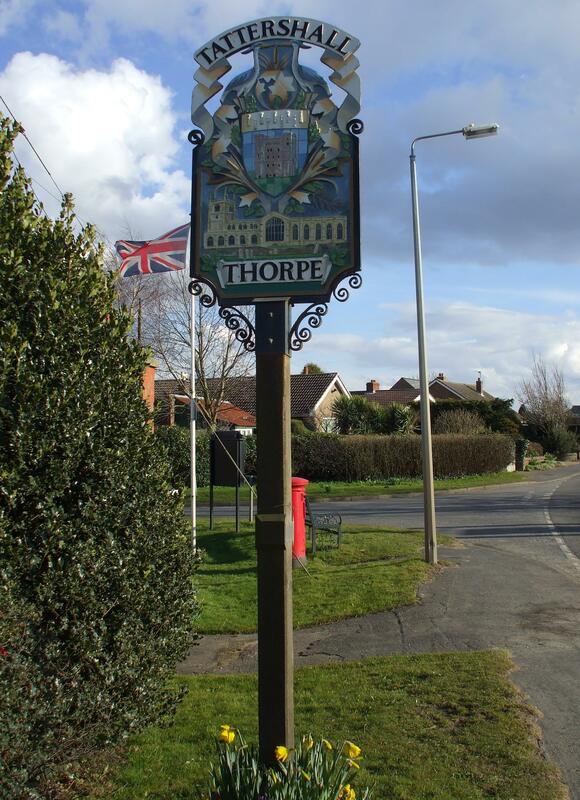 In March, 1887, a portion of Tattershall Thorpe parish was added to this parish. The parish was in the southern division of the ancient Gartree Wapentake in the East Lindsey district in the parts of Lindsey. The Tattershall Parish Council has a presence on Facebook. They are NOT staffed to answer family history questions. Kelly's 1913 Directory of Lincolnshire places the parish, perhaps in error, in the South Lindsey district of the county. The parish had 10 tenements, occupied by 10 poor families, first established here as almshouses in 1440 by Sir Ralph de CROMWELL. Richard CROFT has a photograph of the Almshouses on Geo-graph, taken in March, 2007. And Richard C. has another view of the Almshouses on Geo-graph, taken in February, 2008. In 1834, Hirst GIBSON bequeathed a charity which annually gave cloth and money to the parish poor. As a result of the 1834 Poor Law Amendment Act reforms, the parish became part of the Horncastle Poor Law Union. Bastardy cases would be heard in the Horncastle petty session hearings every Saturday. A National School was established here some time prior to 1842 and replaced by a new building in 1864. The school had been held in the parish church originally. The school was enlarged in 1873 and again in 1907 to hold up to 138 children. The Gartree Community School (built 1954) is a secondary modern school for ages 11-16 on Butts Lane. The school also serves Coningsby and Woodhall Spa.